The Butler volleyball team gathers before their Nov. 9 game against Marquette. The Bulldogs fell to Marquette before defeating DePaul in their final home game of the year. Photo by Jimmy Lafakis. 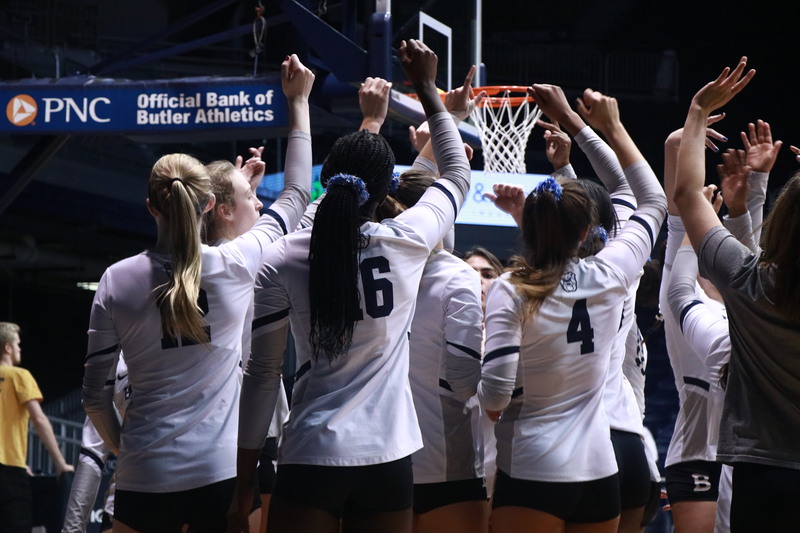 The Butler University volleyball team split a weekend series against No. 18 Marquette University and DePaul University. Those matches were Butler’s final two home tilts of the season. Butler now stands at 9-19 (6-10 Big East) on the season following a loss to the Golden Eagles and win over Blue Demons. On Nov. 9 against Marquette (25-19, 25-15, 25-21), both junior outside hitter Brooke Gregory and senior middle blocker Bri Lilly tied for the team lead with six kills. Redshirt freshman middle blocker Melody Davidson added a game-high six blocks. The Bulldogs sent off Lilly, Takeda, and redshirt junior setter Maddie Freiwald with a senior day win on Nov. 11. Butler defeated the Blue Demons 25-22, 25-12, 25-16. Freiwald recorded a team-high 31 assists, six blocks, five digs and three kills in her final match at Hinkle Fieldhouse. Lilly added five kills and hit for a .455 attack percentage. The Bulldogs will head east to face Villanova University and Georgetown University this weekend. First serve against the Wildcats is scheduled for Nov. 16 at 7 p.m.
“We saw how well we can play when we’re in sync and communicating at a high level,” Lilly said.